Zhang, L., Yu, T., Nan, Z., Wu, Z., Li, B., Li, S. (2018). Application of the Modified Biochar from Sewage Sludge for Removal of Pb(II) from Aqueous Solution: Kinetics, Equilibrium and Thermodynamic Studies. Iranian Journal of Chemistry and Chemical Engineering (IJCCE), 37(3), 161-169. Lequn Zhang; Tao Yu; Zhongren Nan; Zhenjun Wu; Bin Li; Shunyi Li. "Application of the Modified Biochar from Sewage Sludge for Removal of Pb(II) from Aqueous Solution: Kinetics, Equilibrium and Thermodynamic Studies". 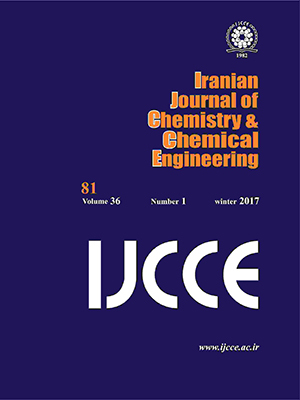 Iranian Journal of Chemistry and Chemical Engineering (IJCCE), 37, 3, 2018, 161-169. Zhang, L., Yu, T., Nan, Z., Wu, Z., Li, B., Li, S. (2018). 'Application of the Modified Biochar from Sewage Sludge for Removal of Pb(II) from Aqueous Solution: Kinetics, Equilibrium and Thermodynamic Studies', Iranian Journal of Chemistry and Chemical Engineering (IJCCE), 37(3), pp. 161-169. Zhang, L., Yu, T., Nan, Z., Wu, Z., Li, B., Li, S. Application of the Modified Biochar from Sewage Sludge for Removal of Pb(II) from Aqueous Solution: Kinetics, Equilibrium and Thermodynamic Studies. Iranian Journal of Chemistry and Chemical Engineering (IJCCE), 2018; 37(3): 161-169. An adsorbent Modified Biochar (MB) made from sewage sludge was characterized with FT-IR spectra and SEM image. The effects of contact time, solution temperature, pH and initial concentration on the adsorption performance Pb(II) onto MB was investigated in a batch adsorption experiment. Results showed that MB had great adsorption capacity, due to the existence of hydroxyl, carboxyl, ether, alcohol and amino groups. As the contact time prolonged, the adsorption quantity of MB increased sharply first and then tended to the balance. The adsorption capacity increased slightly with the temperature increase. The effect of pH on the absorbability of MB was non-linear, and the maximum adsorption capacity was obtained when the pH was approximately 6. The adsorption capacity increased abruptly first and then become slowly with the initial concentration increase. Compared with the pseudo-first-order, the pseudo-second-order kinetic models were more suitable to test the kinetic experimental data. Equilibrium data were analyzed using the Langmuir and Freundlich isotherm models and it was found to correspond to the Langmuir isotherm model better. Shi Z., Zou P., Guo M., Yao S., Adsorption Equilibrium and Kinetics of Lead Ion onto Synthetic Ferrihydrites, Iran. J. Chem. Chem. Eng. (IJCCE), 34(3): 25-32 (2015). Blázquez G., Martín-Lara M.A., Tenorio G., Calero M., Batch Biosorption of Lead(II) from Aqueous Solutions by Olive Tree Pruning Waste: Equilibrium, Kinetics and Thermodynamic Study, Chem. Eng. J., 168(1), 170 (2011). Huang K., Zhu H., Removal of Pb2+ from Aqueous Solution by Adsorption on Chemically Modified Muskmelon Peel, Environ. Sci. Pollut. Res., 20(7): 4424-4434 (2017). Li Y.H., Di Z., Ding J., Wu D., Luan Z., Zhu Y., Adsorption Thermodynamic, Kinetic and Desorption Studies of Pb2+ on Carbon Nanotubes, Water Res., 39(4): 605-609 (2005). Shakeri A., Hazeri N., Valizadeh J., Hashemi E., Kakhky A.R.M., Removal of Lead (II) from Aqueous Solution Using Cocopeat: An Investigation on the Isotherm and Kinetic, Iran. J. Chem. Chem. Eng. (IJCCE), 31(3): 45-50 (2012). Kratochvil D., Volesky B., Advances in the Biosorption of Heavy Metals, Trends in Biotechnology, 16(7): 291-300 (1998). Bailey S.E., Olin T.J., Bricka R.M., Adrian D.D., A Review of Potentially Low-Cost Sorbents for Heavy Metals, Water Res., 33(11): 2469-2479 (1999). Yousef R.I., El-Eswed B., Al-Muhtaseb A.H., Adsorption Characteristics of Natural Zeolites as Solid Adsorbents for Phenol Removal from Aqueous Solutions: Kinetics, Mechanism, and Thermodynamics Studies, Chem. Eng. J., 171(3): 1143-1149 (2011). Nekoo S.H., Shohreh F., Experimental Study and Adsorption Modeling of COD Reduction by Activated Carbon for Wastewater Treatment of Oil Refinery, Iran. J. Chem. Chem. Eng. (IJCCE), 3(32):81-89 (2013). Muftan H.E.-N., Sulaiman A.-Z., Alhaji M., Reduction of COD in Refinery Wastewater Through Adsorption on Date-pit Activated Carbon, J. Hazard. Mater., 13(1-3):750-757 (2010). Yang Y., Sheng G., Enhanced Pesticide Sorption by Soils Containing Particulate Matter from Crop Residue Burns, Environ. Sci. Technol., 37(16), 3635-3639 (2003). Zhu D., Kwon S., Pignatello, J.J., Adsorption of Single-Ring Organic Compounds to Wood Charcoals Prepared under Different Thermochemical Conditions, Environ. Sci. Technol., 39(11), 3990-3998 (2005). Wang X., Sato T., Xing B., Competitive Sorption of Pyrene on Wood Chars, Environ. Sci. Technol., 40(10), 3267-3272 (2006). Yu X., Pan L., Ying G., Kookana R.S., Enhanced and Irreversible Sorption of Pesticide Pyrimethanil by Soil Amended with Biochars, J. Environ. Sci., 22(4), 615-620 (2010). Chen D.Z., Zhang J.X., Chen J.M., Adsorption of Methyl Tert-butyl Ether Using Granular Activated Carbon: Equilibrium and Kinetic Analysis, Int. J. Env. Sci. Tech., 7(2):235-242 (2010). Wu Z., Li S., Wan J., Wang Y., Cr(VI) Adsorption on an Improved Synthesised Cross-Linked Chitosan Resin, J. Mol. Liq., 170, 25-29 (2012). Yan H., Zhang W., Kan X., Dong L., Jiang Z., Li H., Yang H., Cheng R., Sorption of Methylene Blue by Carboxymethyl Cellulose and Reuse Process in a Secondary Sorption, Colloids Surf., A., 380(1-3): 143-151 (2011). Ho Y.S., McKay G., Sorption of Dye from Aqueous Solution by Peat, Chem. Eng. J., 70(2): 115-124 (1998). D’Arcy R.L., Watt I.C., 1970. Analysis of Sorption Isotherms of Non-Homogeneous Sorbents, Trans. Faraday Soc., 66: 1236-1245 (1970). Laus R., Costa T.G., Szpoganicz B., Fávere V.T., Adsorption and Desorption of Cu(II), Cd(II) and Pb(II) Ions Using Chitosan Crosslinked with Epichlorohydrin-Triphosphate as the Adsorbent, J. Hazard. Mater., 183(1-3): 233-241 (2010). Swiatkowski A., Pakula M., Biniak S., Walczyk M., Influence of the Surface Chemistry of Modified Activated Carbon on Its Electrochemical Behaviour in the Presence of Lead(II) Ions, Carbon, 42(15): 3057-3069 (2004). Lodeiro P., Barriada J.L., Herrero R., Sastre de Vicente M.E., The Marine Macroalga Cystoseira Baccata as Biosorbent for Cadmium(II) and Lead(II) Removal: Kinetic and Equilibrium Studies, Environ. Pollut., 142(2): 264-273 (2006). Acharya J., Sahu J.N., Mohanty C.R., Meikap B.C, Removal of Lead(II) from Wastewater by Activated Carbon Developed from Tamarind Wood by Zinc Chloride Activation, Chem. Eng. J., 149(1-3): 249-262 (2009). Chen X., Chen G., Chen L., Chen Y., Lehmann J., McBride M.B., Hay A.G., Adsorption of Copper and Zinc by Biochars Produced from Pyrolysis of Hardwood and Corn Straw in Aqueous Solution, Bioresour. Technol., 102(19): 8877-8884 (2011). Chen S., Yue Q., Gao B., Xu X., Equilibrium and Kinetic Adsorption Study of the Adsorptive Removal of Cr(VI) Using Modified Wheat Residue, J. Colloid Interface Sci., 349(1): 256-264 (2010).